They've bragged about being able to cook and get perfect scores. But everything fell apart for MKR's resident beauty queens Veronica and Piper when they were put to the ultimate culinary test at their instant restaurant. 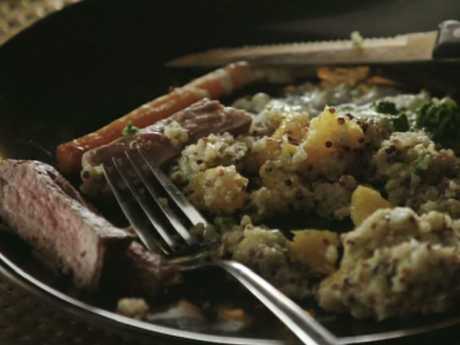 The high-achieving Sydney super mums, who have boasted about thriving under pressure, were brought undone with their dinner party's main course - Scotch fillet with quinoa salad and gremolata. The seemingly failsafe dish turned out to be a palaver of undercooked meat that MKR judge Manu deemed "a hot mess", earning them a score of 5 out of 10. My Kitchen Rules beauty queens Veronica and Piper had high hopes. Despite their high hopes for a perfect score of 130, the beauty queens bombed out with an overall score of 64, dropping them to the bottom of the leaderboard. It all began so hopefully when the beauty queens were shopping for their ingredients. "We have 16 steaks that need to be medium-rare so we wanted to add a component to this dish that had a little more freshness to it, so we thought a quinoa salad would do that, said Home Shopping Channel model Piper as she hit the supermarket. The perfect pair struggled with their main course. "I think there's definitely going to be a few teams that question our menu because that's the type of people they are," Piper giggled. "I'm excited to have everybody over. But you know what, overall I think they're going to like it". As Piper predicted, their choice of an entree of croquettes with sauce gribiche, and poached pears with zabaglione for dessert, raised the eyebrows of their fellow contestants. "This is confusing," said a po-faced Bianca. "We've got some South American, we got some Italian, we've got some good old Aussie." 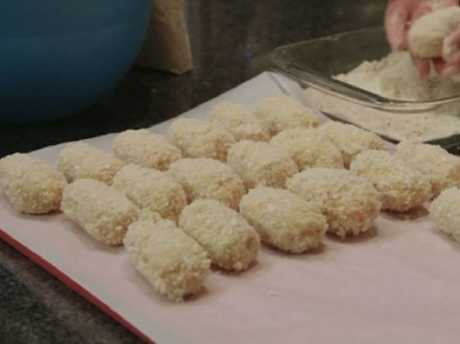 Their croquettes failed to make the cut. The ever-glam friends - who met while doing pageants and went on to become Mrs Australia International 2012 and 2015 respectively - made sure they were dressed for the occasion by donning their pageant gowns. "We are rock stars in the kitchen. We work so efficiently together. We're so organised. OK, let's get into it, girl." Piper said as she and Veronica downed a glass of white as they got ready for the night. Continuing the "Fit For a Queen" theme of their instant restaurant, their fellow contestants were even given beauty queen sashes to wear. The pair’s fellow contestants scoffed at their menu choices. Contestant Bianca was less than impressed. "If you're aiming for a perfect score and you want to be delusional, you know, prove me wrong," she said. "But I'm right. Are they too perfected, too refined, too dignified to really perform under pressure?" Despite the unbridled optimism of Veronica and Piper, things didn't bode well when they served up their entree. "I was shocked," said fellow contestant Karolina. "I thought there was definitely going to be good presentation but it's just this sauce with too little nuggets." In what seemed like a backhanded compliment, judge Pete Evans praised the entree's "subtle" flavour but said he "wanted more" and that it looked a "little bit small". Veronica fights back tears as it all goes wrong. Fellow MKR judge Manu also bemoaned the lack of pizzaz. "I really loved the flavour of this dish. I absolutely loved the flavour of the sauce gribiche. But what I'm missing, a little bit more kick of the smokiness," he said. "I was expecting a little more zing with the lemon juice. Not a bad start." But there was far worse for Piper and Veronica when it came to the main course. After grappling with the tricky timing of ensuring 16 steaks were cooked medium rare, the pair's perfect facade came undone. "So up to this point we're travelling really well. The steaks have rested. It's time for us to cut into our steaks, ready to serve," said Piper, as she cut into the steak with the intensity of a surgeon. "Some is medium rare, some is not. I just don't know why our steaks are all cooked like this. It doesn't make sense to me. This is cooked all the way through so we won't be able to serve that." Judge Manu called the dish “a hot mess”. As Veronica went to grab more steaks to throw into the pan, Piper tried to perform a salvage operation but was dismayed when she realised it was a no-go. "It's medium. I'm cutting all these steaks they're really inconsistent. I'm feeling like this could be the dish that runs it all into the ground. Too done. These are all overdone, overdone. Every single one. Do we have any more steak? We bought so much a steak and thank God we did. We just can't get the steaks right." As Piper tried to hold it together, Veronica went into a stream-of-consciousness monologue. "I've never felt this much pressure in my life, Piper. We're going to get it perfect. We're going to get the plates perfect. It's all going to come together," she said. "We'll be proud of what we're doing. Perfect, perfect. We have to make this perfect. Can I just cry now?" "No. Don't cry," said Piper. Manu was typically scathing when it came to the taste test. "I can just taste the dish with my eyes. It's a hot mess. Veronica and Piper, were you proud of getting out of the kitchen with this in your hands, presenting it to us?" Failing to redeem themselves with their dessert, the perfect pair were left shattered by the night's events. Their next challenge will be the elimination cook-off.